Now that the NFL has the attention of the nation, it's time for us all to actually remember why players took a knee in the first place and start talking about what we're going to do about it. WASHINGTON — Systemic racism and the killing of unarmed black men, women and children by police. That’s not a particularly fun topic for anyone. It’s a lot easier for football fans and players to talk about Tampa 2 defenses and wide receiver bubble screens. It could easily be ignored by the thousands of black athletes who have worked their entire lives to make it to the top ranks of the professional sports world, far away from the very modest roots from which many of them sprung. It’s especially risky to speak up in the non-guaranteed contract world of the NFL. But the players didn’t ignore the issue. They instead risked their careers — literally, in the case of Colin Kaepernick — to call attention to the problem: Systemic racism and the killing of unarmed black men, women and children by police. I repeated that, and will continue to repeat that, because anyone insisting that any of this has to do with the national anthem is, at this point, intentionally diverting attention away from that issue. Eric Reid, the player who first knelt alongside Kaepernick, reiterated those reasons and the duo’s attempts to be respectful in their protest in a New York Times column Monday. 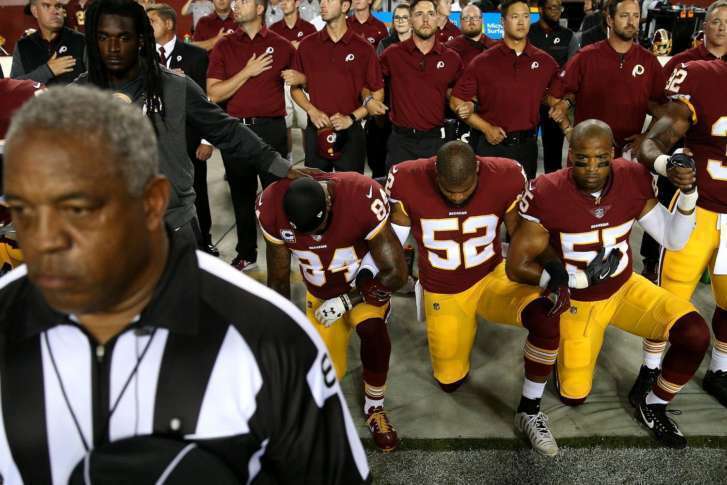 He reminded the world that before taking action, they consulted with fellow NFL player Nate Boyer, retired Green Beret, who helped them come to the conclusion to kneel, rather than to sit. Bruce Maxwell — a catcher on a rookie contract, the son of an Army lifer who was born on a military installation in Germany — became the first Major League Baseball player to take a knee, hand over his heart, facing the flag. Professionally, he has everything to lose, and he did so anyway. Why? Systemic racism and the killing of unarmed black men, women and children by police. So if you find yourself continuing to insist that these athletes’ actions are somehow ungracious, rather than the carefully considered, deliberately respectful action they are, it’s clear that you’re doing whatever you can to avoid the actual issue they want to bring to light. How many of the people complaining about players silently taking a knee were screaming at them Sunday during the playing of the anthem? How many of you from Maryland have screamed “O!” in support of the Orioles during the line “Oh say does that star-spangled banner yet wave?” How many of you have ever gone to the bathroom, or bought a hot dog while the anthem played? Don’t get it twisted — this is not about disrespecting the anthem — it’s about systemic racism and the killing of unarmed black men, women and children by police. The Wall Street Journal Editorial Board published the most willful-ignorance-posing-as-common-sense piece I’ve seen to date Sunday, in which they managed to disparage NFL players for protesting without ever once actually mentioning the reasons for the protest (systemic racism and the killing of unarmed black men, women and children by police). The editorial instead blames “progressive forces of identity politics” and declared that “the left” claimed Kaepernick’s continued unemployment was due to “race and class,” which tells you everything you need to know about what they really think. After spending the first three graphs entirely falsely framing the argument and ignoring the real issue, the piece went both sides-ing the rest of the way, calling out President Trump for his continued overreaction to the entire situation. This is same thing Bill Lynch, owner of the Washington Spirit, did last year when he played the national anthem with the players still in the locker room so that Megan Rapinoe could not kneel in solidarity with Kaepernick, as she had done at previous matches. Instead of spending his energy on the issue at hand, which he claimed to care deeply about but did not name — systemic racism and the killing of unarmed black men, women and children by police — he drew attention to himself and away from the actual reason. It’s clear that these protests have touched a nerve — that is their intention. If they were done “on the players’ own time,” as some have suggested they should, they would not be nearly as effective, nor would the players be risking as much as they are. People clearly care — I know, because you’ve read this far. But it’s clear some are still caught up in the form of protest. They’ve made it clear they have heard the message, but that they’ve refused to listen to what it actually means. Now that the players know that — on both fronts — don’t expect them to stop anytime soon. Because what Kaepernick, Maxwell, and everyone else taking a knee has said this weekend is this: Calling attention to this social issue is more important than professional sports. That is as selfless as it gets, despite what the Wall Street Journal, or Lynch, or any of the paid professional trolls would try to make you believe. Say it one more time with me: Systemic racism and the killing of unarmed black men, women and children by police. Now stop deflecting and let’s all start asking each other what we can do about it.